Cauliflower (Brassica oleracea) is a ‘Cole’ crop, a member of the cabbage family that also includes Brussels sprouts, collards, mustard, turnips, kohlrabi, kale and watercress. According to the USDA, 35,000 acres of Cauliflower were harvested in the United States in 2009. There are also green and purple varieties of cauliflower. Another newer member of the family is Broccoflower, a cross between broccoli and cauliflower. 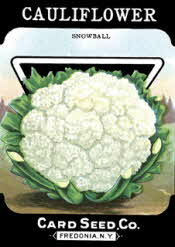 According to Mark Twain "Cauliflower is nothing but a cabbage with a college education." The white, edible portion of cauliflower is called the curd, heart or head.